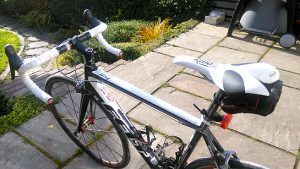 “44 year old male – I bought my Rido RLt after suffering from pudendal neuralgia that was brought on by a stress fracture to my pelvis (years on a bad saddle). Prior to this I was a very keen Masters level MTB Marathon racer. As anyone out there who has suffered from this condition will know, pudendal nerve issues will stop you in your tracks and make riding a miserable experience. When it gets bad it will also interfere with work and home life. While I’m not cured from the condition and may never be completely, I was facing the real possibility of a life with no cycling, unless you count recumbents! “The Rido saddle has allowed me to ride again with near-zero perineal pressure and critically, get my pelvic position right on the bike (rearward tilt – more upright). The problem with many other saddles I tried was that although allowing me to get up on the sit bones, when some rearward pelvic tilt was added, the perineum still experienced pressure where the nerve is which will take you back to square one. 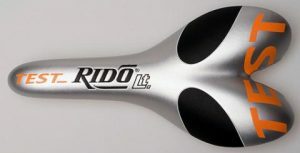 I’m pretty sure that I would have never developed the issue had I been on the Rido saddle. It may take some getting used to but I can honestly say these saddles will keep most folks from developing the sort of problems I’ve suffered from. “Lovely saddle, certainly takes the pressure off the perineum. Because the ischial tuberosities take the strain instead, I actually got a discrete blister on the left..!! Have advertised the Rido brand at my local cycle shop, Ralph-Colman, in Staunton. “Hi guys, I’ve had the RLt for a month now and I thought I’d let you know my thoughts. I’m a 52 year old male club cyclist. I’ve struggled for years to find a comfortable saddle and I’d accepted that saddle discomfort and mild numb nuts was just part of the deal when cycling. I’m doing LeJog in September and after reading the reviews on your website I thought I’d give your RLt a go. The saddle is well made, looks the part on a road bike and isn’t expensive. For me, the rails could do with being a shade longer. Initially I couldn’t get the saddle set up in an ridable position despite following the instructions; my weight was always on my hands. A fellow club member has the same saddle and he advised lifting the nose a few degrees. This transformed my whole ride. 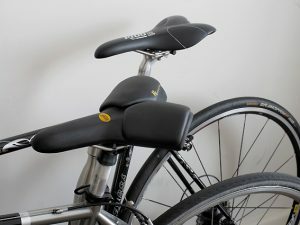 The window for a comfortable position is much smaller than for other saddles. It took my friend 6 weeks to get it right but now he’ll never ride another saddle (he had repeat episodes of perineal abscesses that have been eliminated since switching to a Rido). I’ve given the saddle a fair test with club rides, high intensity turbo sessions and a three day ride-out with consecutive rides of 45, 90 and 80 miles. There were no issues with soreness. As others have reported, when you get back on your bike mid-ride there is no sudden stab of pain. On the drops I do get a little numbness which tells me I haven’t quite found the perfect position yet but I’m only a mm or degree away. Overall I’m really pleased with the Rido RLt; it really is fit, set up and forget. “First of all, I’m sorry about my poor English. 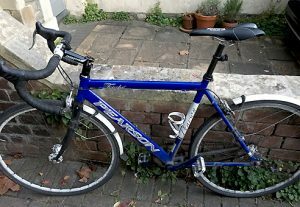 I’m riding a Rido RLt from about 3-4 months, on a Cervelo R3 roadbike. My typical ride lasts from about 1:30h to 3 hours, covering a distance from 40 km to 70-80 km, 2-3 times at week. 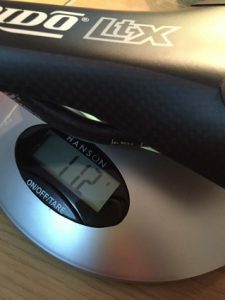 During the upright position, my Rido gives me the same level of comfort that I’ve experienced from the cutout saddles design, like the SMP or the Specialized Romin. But where I got the greatest benefits, is on the more aggressive “hands down the drops” position, where your saddle design makes a big difference, in positive. At the end, I’m really happy with my RLt, and I’m planning to buy another one for my winter bike next months. If I can suggest, I would change a little the aesthetic, cutting off some of the rear part (take a look at the red line on the attached image), and adopting a more attractive colorscheme, like the AX lightness endurance plus for example. “I’ve got to say I’m really pleased with both my RIDO RLt saddles! I’d been getting some annoying numbness following longer rides on my road bike and this has completely disappeared since switching saddles. Thank you for the use of the test saddle. I’ve tried it on my commuter bike and on my carbon road bike covering about 120km – I got on brilliantly well with it on both bikes. Haven’t needed to make any angle or front-back adjustments. I got used to the unusual shape quickly and within 10km or so it felt natural. I’ve got no numbness or strange sensation at all after riding, and on my commuter bike in particular I felt like I could really put the power down even over bumpy London road surfaces without worrying about hurting myself down below. I would like to order! I will definitely be recommending Rido. (1) “Has made a big difference to level of comfort during/after a ride. Still experimenting with position and making tweaks but getting there. Will send a more comprehensive review and pics before end of summer but generally it’s working great. Many of these adventure races have relatively short cycle sections (maybe 50k max). But you do get a range of terrain including tarmac, concrete, dirt track and trail sections which can give a good buffeting. So I switch bikes depending on the terrain i.e. I use the F4 for most races but switch to a customized cyclocross bike for more extreme terrain. “Seriously impressed with the new RIDO Ltx. Looks and feels fantastic. I like the way it’s same shape as the RLt. It is incredibly light. This one came out at a 112g. Very impressed. Without the packaging you could have stuck a 1st class stamp on it and I’m sure it would fit through the letter box. It’s a beautiful saddle and design. With a really good pair of shorts I wouldn’t be surprised if you could ride it all day long. It’s perfect for 10/25mile time trials. “The saddle turned up last week. I taped the rails as suggested, however there was no need to as I knew it was right before I had even made it out of the driveway. Perfect. A week of consistent riding on it straight out of the box. This saddle has opened up a lot more riding for me. Does what it says on your promo. Really surprised that no-one I spoke to heard of them. Says something about the larger cycling industry I guess? … I had a quadruple bypass 12 months later. While there I told a night nurse about your wonderful saddles and the very next day, he told me he had placed an order. … Decided the best way of doing my required daily exercise was to ride to work. … Convinced my brother, Bernard, who was complaining about saddle soreness (due to always having to sit upright on his bike) that he would not go wrong by investing in one of your saddles. Now he too owns one. … He now tells me that he wants to buy a second one as a Christmas present for his son. I did buy that camera as a present for getting through my heart issues so nicely. So here are pictures of my daily commute saddle and my weekend ride saddle. I Love my RLt for making my half hour ride to work an enjoyable activity. Though not quite as comfortable, my R2 really complements how my weekend show pony (turns me into the Cisco Kid); it’s so easy on the eye and the bum! “So this is my 3rd year using Rido and can honestly say I wouldn’t want to ride with anything else. © RIDO SPORT LTD 2018 / "Bring comfort to your cycling"